THE tebung (hollow wood drum) of Bario sounds the wake-up call at 5.30am like clockwork everyday. And indeed it is the clock of the Highlands. FOR A BETTER FUTURE: A Penan mother walking her child to school in the early hours of the morning. The beautiful rainforest sound resonates through the forest, rousing the late wakers among the fauna as well as the little children of Bario Asal and the surrounding villages. The tebung (at least one in each Highland village) also belts out the same wake-up call in the other settlements although not all at 5.30am like Bario. For example, at Pa Adang (a Penan settlement) in the upper reaches of the Lawas valley, the wake-up call is at 6am. 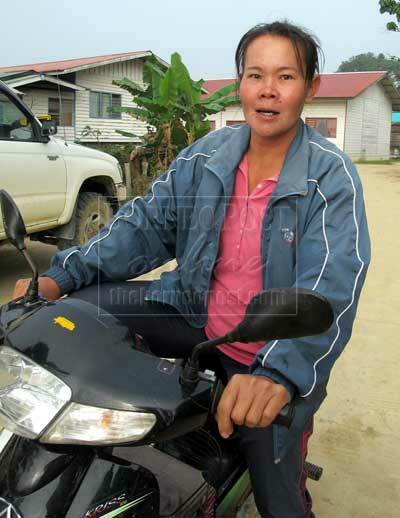 Usually, by this time, many Penan mothers from Aral Dalan will be walking along the lonely path to Bario Asal where their children attend pre-school and primary classes. They walk for one hour (from six to seven) and surprisingly – to many urbanites – will arrive at school fresh and happy. This is a feat not many city people can easily fathom. After placing their children safely at school, the Penan mothers walk for another hour home. Their next journey (on foot) to Bario is at 11am to pick up their children. After that, it’s another hour’s walk home. Walking long distances is part of Penan life from time immemorial. Pre-school education in Sarawak and Malaysia in general provides a simple meal cooked by the teachers and teaching assistants. Hence, the Penan mothers do not have to bring lunch packs to their children. Most of the Penan children are underweight. Some even look just three years old – not five! According to medical doctors serving in Sarawak, Penan children may be small due to various factors like lack of proper nutrition and good healthcare. Genetically, the Penans are small in stature and very fine-boned. In the early mornings at the Bario Highlands, the temperatures can be as cool as 23 degrees celcius or lower. And it used to be even lower when luxuriant tall trees covered the mountains and no roads were known to the Penans. The Penan mothers and children who walk to Bario, wear wind breakers or warm woollen clothes. And some of the children are so used to being barefooted that they don’t necessarily wear shoes (most cannot afford shoes anyway). 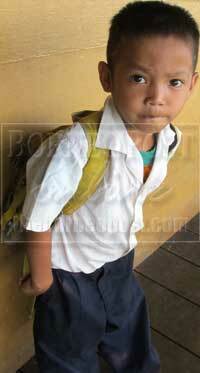 WAITING FOR MUM: A Penan boy waiting for his mother to pick him up from school. The mothers I met said they were from Aral Dalan, a Kelabit village now giving them generous space and shelter. Some of these Penans are actually building their huts near the National Park of Pulong Tau. Being nomadic in the past, they cannot say exactly where their original settlement was because they were free to roam and hunt a long time ago. So far, upon settling down, they are co-existing well with their Kelabit neighbours in Aral Dalan and Bario Asal. The state government and its various agencies have long been finding ways to identify suitable areas for the Penans, “locate” them and “resettle” them like at Batu Bungan in the Baram. Geographically, the Penans used to be known or classified as nomadic tribes who moved from place to place in the north eastern parts of Sarawak and the upper reaches of the Limbang and Lawas Rivers. Further south, they were found in the Kelabit Highlands and the Belaga region or the upper Rajang. Today, some remnant groups are known to be the last of the nomadic tribes of Sarawak. Several groups have settled down and are receiving good education. About 100 Penans have obtained diplomas and degrees since the formation of Malaysia while one or two are already millionaires. Bario is a special case because more than 20 Penan families have settled at Aral Dalan, a village about one hour from Bario. According to some villagers, the Penans have moved to this part because their children can attend school at neaby Bario. Besides, the environment near the National Park of Pulong Tau also seems most viable to their lifestyle. Young Penan parents are sending their children to pre-primary and primary schools in Bario. Moreover, many are fairly comfortable with the kind Kelabits who share the same religious beliefs. The Penan parents also like the primary school teachers from all parts of the state – Kapit and Sibu, for example. According to a little Penan boy, these teachers are not only caring but can also teach very well. PART TIME JOB: This Penan girl is working temporarily for the primary school in Bario. For the very first time, they are interacting and having good social life in school. Furthermore, they can broaden their outlook by participating in everyday learning in the classrooms with children from the other communities such as Malays and even Bidayuhs (children from the Army Camp at Bario). Several children at the Bario Primary School are of mixed parentage – Kelabit-Chinese and Lun-Bawang-Kelabit. It is from their primary school experience that the Penan children are able to have a wider world view. One young Penan girl, now working temporarily at the primary school, said she hoped to get a permanent job with the government. This, she added, would give her and her family a steady income. She is looking forward to the day when she either goes for further studies or gets a permanent job with the government. She is not afraid to leave Bario for other parts of the world. THUMBS-UP: These two Penan children walk long distances everyday to attend pre-school in Bario. According to a professional in Marudi, many of the myths about the Penans are not being debunked. He noted that with better government facilities being provided in the remote areas, more and more Penans are settling down. Penan parents now realise the importance of keeping their children in school throughout the whole school year as opposed to the common perception that Penan parents will take their children out of school during the fruit season. Perhaps, this is still being done by some Penan parents in the remotest parts of the state but it is very rare because of changes to their lifestyle, good advice from the community leaders and better educational facilities provided by the government in the interior. More and more Penans want their children to be educated and get permanent jobs as teachers and government servants after leaving school. As one Penan mother puts it: That’s why I’m willing to walk four hours everyday to send my two children to school. It’s their future. It’s also my future.